This article explains about CPU Masking in Cloudstack. Also I deal with Heterogeneous Clustering in Cloudstack Xen (XCP) hypervisor platforms. Configuration, but if we need to add different Hosts to Same Cluster (Heterogeneous cluster) then we need to mask the CPU of different host to a common one. Why should I Mask CPUs? In order to achieve Heterogeneous clustering, we should be having all the hosts with same CPU Mask. The following steps will guide you to configure CPU Masking and do Heterogeneous clustering to Cloudstack. Homogeneous is so simple which does not even involve CPU Masking. In Cloudstack we can mask the CPU of different hosts to a common mask, to do that we need to know the CPU features of each host which will be added to the cluster. Here, I used CMB Tool to generate common CPU Mask of A and B. 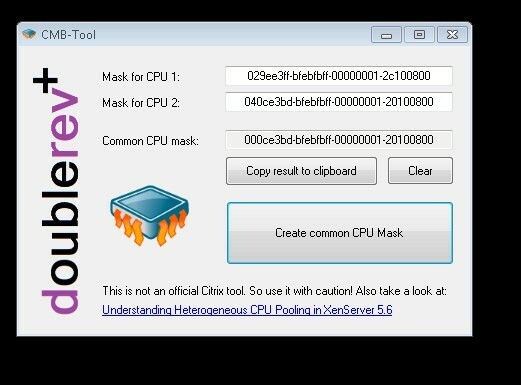 Paste the CPU features of the Hosts and generate a Common CPU Mask. Change the CPU Mask in all the hosts and restart the Hosts to make the change effective.